David Roberts and The Sounds of Sinatra! David Roberts Bio David Roberts was born in New York City. Growing up in the same city that made Frank Sinatra famous, David’s blue eyes and lean look made it easy to slip into the Chairman of the Board/Rat Pack impersonator style. Although it took some time to cultivate the swing/big band style of Ole Blue Eyes, the sophisticated music roots were being formed during the formative years in the Big Apple. Mr. Roberts has lived in Central Florida for many years but is eager to sing live music in Las Vegas or other exiting places overseas. 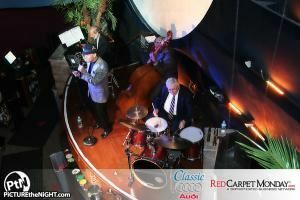 He is one of the best live wedding singers and jazz wedding singers in Central Florida. The David Roberts of today is a successful music performer and music appreciator. He performs live every week to large, appreciative audiences at Vines Grill & Wine Bar in Southwest Orlando. He has played in many of the finer hotels, historical venues and conventions in Florida. Mr. Roberts is as comfortable with swing and big band music as he is with Rat Pack Christmas songs come the holidays. He has made it his ambition to study the best phrasing and the best lyrics to hundreds of Sinatra tunes. He has performed solo and with many of Florida’s finest and best musicians at countless weddings and convention sites. Orlando, Florida’s Chairman of the Board handles Master of Ceremonies duties at wedding receptions. He is a jazz wedding singer and the best solution to all your wedding band, swing music, Rat Pack, Sinatra impersonator and Frank Sinatra or Michael Buble tribute artist needs. I can provide the sophisticated, smooth vocal sounds that elevate my presentation above recorded music. I have been singing professionally in Central Florida for almost a decade. I have performed at countless weddings, corporate events, concerts and private parties. I have also been the lead weekend vocalist at Vines Grille & Wine Bar in Dr. Phillips for almost 8 years. The price includes a 2 hour show with two 10 minute breaks. A deposit of $150 is required within 30 days of the the scheduled event. It may be cash or check. The balance is due the day/night of the performance. The deposit is refundable only if Mr. Roberts has a medical excuse and cannot perform on the scheduled day/night. If Mr. Roberts cannot perform due to a medical condition the client may be offered a suitable replacement vocalist.I will travel anywhere within the Central Florida region to perform. The price includes a 2 hour show with two 10 minute breaks.